History, analysis, and unabashed gossip about the start of the American Revolution in Massachusetts. 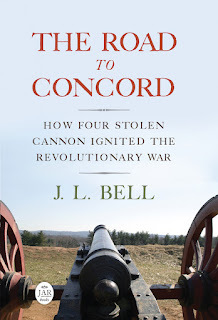 J. L. BELL is a Massachusetts writer who specializes in (among other things) the start of the American Revolution in and around Boston. He is particularly interested in the experiences of children in 1765-75. He has published scholarly papers and popular articles for both children and adults. He was consultant for an episode of History Detectives, and contributed to a display at Minute Man National Historic Park. Celebrating Barrett’s Farm in Concord, 27 Oct.
Hogeland on Founding Finance in Boston, 23 Oct.
Revolution Round Table in Lexington, 22 Oct. I took this photograph at Longfellow House–Washington’s Headquarters National Historic Site this past Saturday. 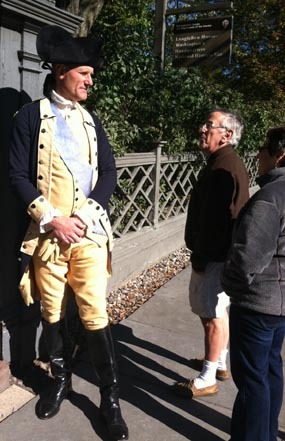 It shows a gentleman of the 10th Massachusetts reenacting group portraying Gen. George Washington, greeting guests at the front gate of the estate. The uniform is modeled after the one Washington ordered for his Virginia militia regiment and then wore to war, as portrayed by Charles Willson Peale and others. The tailor who made this outfit, Henry M. Cooke IV, made two like ones for Mount Vernon. Besides visiting the general and his troops, I had another reason to go to Cambridge on Saturday. For the past few years I’ve been intensely examining Washington’s activity at his first headquarters for what the National Park Service calls a “historic resource study.” And the agency had the first printed copies available at the site that day. General George Washington’s Headquarters and Home — Cambridge, Massachusetts is a 669-page, eighteen-chapter study of how the commander-in-chief came to occupy the mansion that Loyalist planter John Vassall had left behind and what he did there. Over the next couple of weeks I’ll lay out those chapters to show the scope of the report and some of its findings. Spiral-bound copies of this government report are available at Longfellow House–Washington’s Headquarters N.H.S. The agency also plans to make the whole darn thing available for downloading or reading online, but I don’t think that’s ready yet. Sounds like a fascinating read! Any news on when members of the Continental Congress visited Washington's HQ? John Adams, Franklin? A bunch of New Englanders came by in August, including all the Massachusetts men and Silas Deane from Connecticut. There was an official committee from the Congress in October: Benjamin Franklin, Thomas Lynch, and Benjamin Harrison. John Adams consulted with the general a couple of times in January. Some of the other Massachusetts men may have stopped off for pro forma visits on their way to or from Philadelphia. And Robert Hooper, who was born in Massachusetts but represented North Carolina, made a brief visit in February. Thanks for the great info -- looking forward to reading your posts on Wash HQ. BTW, I recently got to visit the very comprehensive Washington exhibit at the Gilcrease Museum in Tulsa. Excellent info all around, on Mount Vernon, Washington's slaves, his upbringing, etc. The exhibit is called "Discover the Real George Washington: New Views from Mount Vernon" courtesy of the Mount Vernon Ladies Association. Over 100 Washington artifacts, and excellent dioramas of Fort Necessity, Mount Vernon and three forensically accurate Washington mannequins from three points in his life -- I highly recommend it! Thanks for the recommendation. Those figures of Washington were also dressed by Henry M. Cooke IV.